Previously on The Four… catch up with episode 18 recap! Turns out the mystery lady Li Mo was begging for help is none other than Wen Ru Yu’s niece, Wen Bing Er. Wen Bing Er claims to have lost her ability to walk when her uncle destroyed the tendons in her legs. He then left her at the foot of the valley, ignoring her for the past two years. 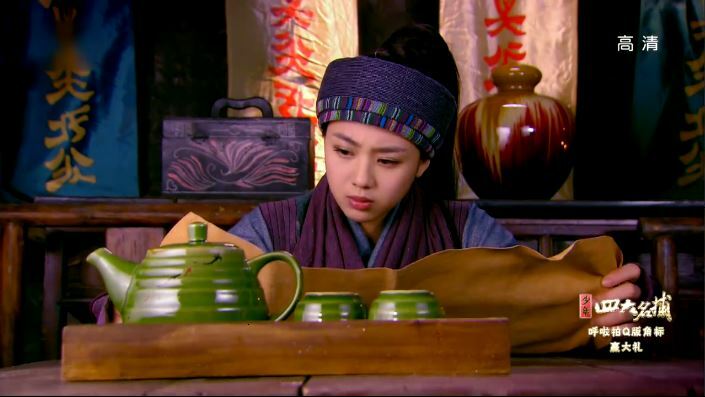 Bing Er offers to help heal both Leng Xue and Li Mo, but she wants them to bring her out of the valley. Apparently the Wen family has three brothers, the oldest, Wen Wang (aka her father) and Wen Yue Hong are those who save people and Wen Ru Yu is the only one who poisons others. Bing Er explains that her father is the one who came up with the poisonous fragrance, but Wen Ru Yu stole it after severely injuring her father. Upon hearing the name of the fragrance, Li Mo thinks of the people who are dying in the hotel. Li Moasks for the cure, but Bing Er reveals that she was dumped in this valley just so she wouldn’t be able to figure such things out. Essentially there is still no cure. 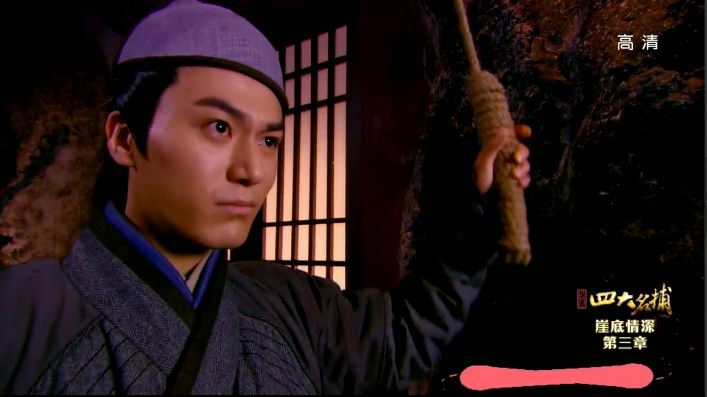 However, Bing Er did find the cure for Du Shou Yan Luo Zhang, which is the martial arts technique Wen Ru Yu promised Yi Yi in the last episode. It is also what Wen Ru Yu used to injure Bing Er’s father and Leng Xue. She is hoping to use this cure against Wen Ru Yu and seek revenge. Meanwhile up in the mountain the Princess is being all grouchy again. But wait who is this that’s knocking at her door? It’s the creeper dude who basically forces himself on her. Just then, Wen Wu Chang comes in to interrupt and Mr. Creeper stabs him, officially starting his rebellion. The Princess whimpers in the corner while bouncing up and down. I’m not sure why she is bouncing, but this is a pretty bad depiction of being scared, although her face spells fear. In the other room, Yi Yi is studying Du Shou Yan Luo Zhang. She secretly plans on learning the technique to use against Wen Ru Yu in case he lies about saving Tie Shou. Not sure if this is going to work, Wen Ru Yu must have mad skills. 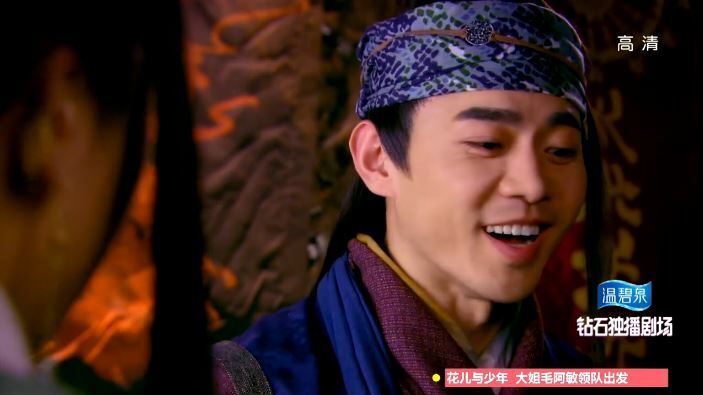 Anyway, Zhui Ming also sneaks into the Princess’ chamber by pretending to be Wen Ru Yu’s student (he stole someone’s badge). And what is the first thing the Princess does? Complain about how slow he is at coming to her rescue. She even threatens to tell her father (aka the Emperor) that Zhui Ming is the one who kidnapped her. I don’t even know what to say. She is crazy! I’m going to skip the screenshot of her because she is just so annoying I don’t need another picture of her occupying my webspace. Booooo. 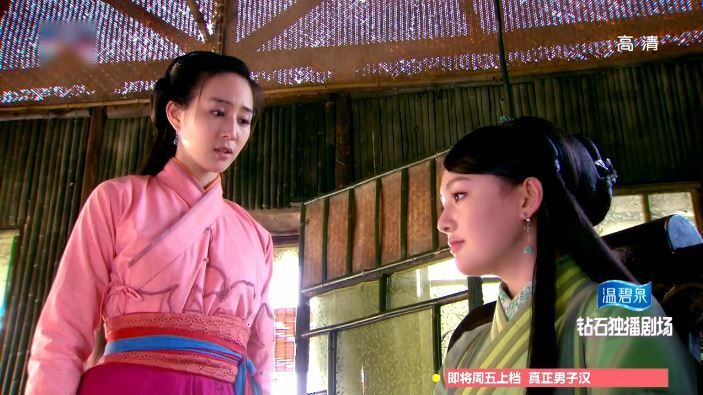 After visiting the Princess, Zhui Ming goes to chat with Ji Yao Hua. She says that Leng Xue fell off a cliff and is probably dead. A saddened Zhui Ming immediately announces plans to uproot Wen Ru Yu’s clan for Leng Xue. 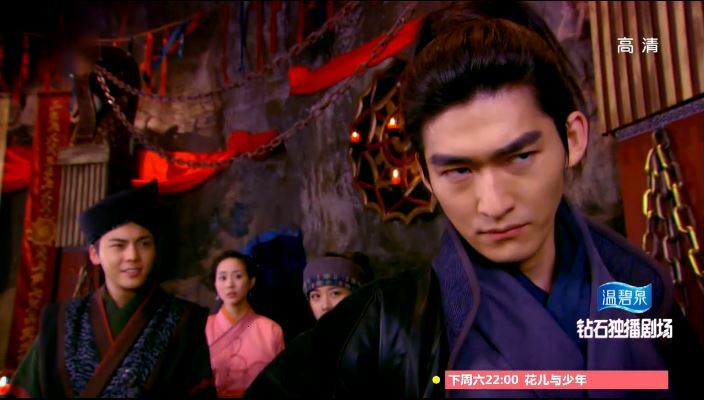 Zhui Ming must be on a roll because he bumps into Yi Yi right after he leaves Ji Yao Hua. 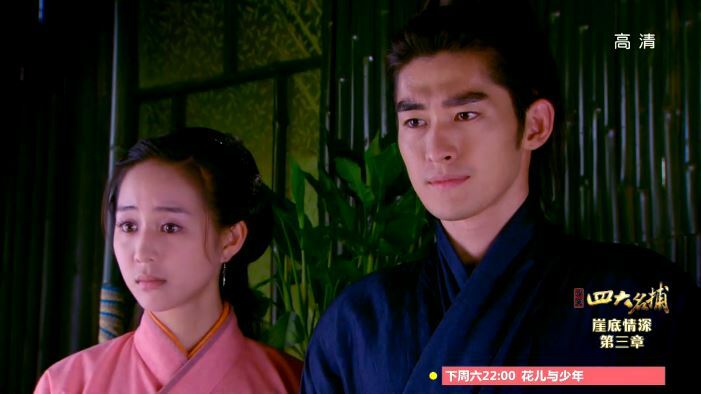 She reunites him with Tie Shou and they hatch a plan to capture Wen Ru Yu the night of his wedding to the Princess. They also consider how to face Wen Wu Chang and the creeper guy. Wait, so the Princess didn’t tell Zhui Ming that Wen Wu Chang is dead? And nobody cares where Li Mo is? Some friends they are! Later that night Li Mo brings over four small green fuzzy peaches for Leng Xue to eat, but he refuses on the ground that she did not have any. Li Mo: You haven’t eaten all day, you must be hungry. Here, eat some. Leng Xue: Have you eaten? Li Mo: Yes, I did. Leng Xue: Then eat one more. Li Mo: I’m not hungry, you have it. Leng Xue: You are obviously lying. Here, eat them. Also, thanks for the vest, but you should put it back on, it can save your life. Li Mo: You have just healed, why did you take it off? Leng Xue: You don’t know any martial arts, you wear it. Li Mo: You wear it. Leng Xue: I told you to wear it. Li Mo: Aiyah, what’s wrong with you today? You are nagging so much. First you are telling me to eat, now you are asking to wear this. You put it back on. Leng Xue: You wear it. Li Mo: I told you to wear it so wear it! Leng Xue: There is only one reason, and that is because I care for you. Also, Li Mo eats the peaches. So now back at the mountain, it is time for Yi Yi to sacrifice her limb. She picks up the knife and throws it at Wen Ru Yu who dodges the weapon with ease. He reveals that he knew she wasn’t for reals and that the technique book he gave her is a fake. Apparently after she learns the fake technique she must continue to eat scorpions and other poisonous bugs to sustain her life. If she doesn’t eat them, she will die from bleeding and rotting. 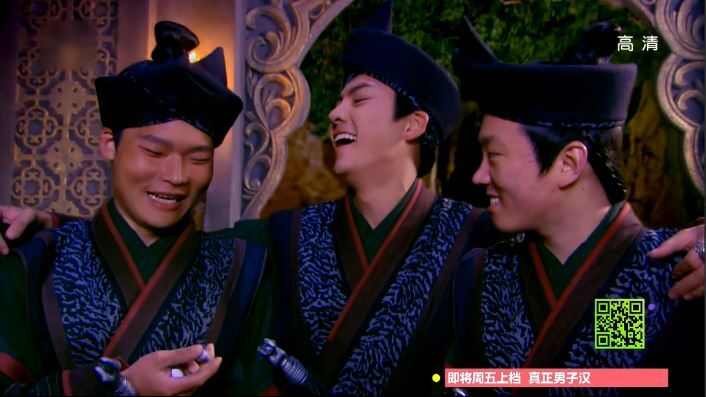 Just as Wen Ru Yu is about to take Yi Yi’s arm someone comes to report that it is time for the wedding. Wen Ru Yu asks for his son, but no one knows where he is. Of course, that’s because he is dead! Mr. Creeper offers to substitute for Wen Wu Chang, but Wen Ru Yu rejects the idea completely. What’s the solution? 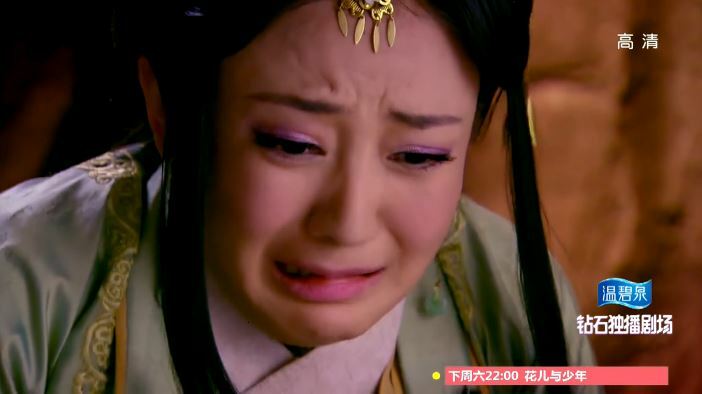 Wen Ru Yu decides to marry BOTH the Princess and Ji Yao Hua. Ew. What a greedy old man! In the other parts of the mountain Tie Shou leads the Princess and Ji Yao Hua out through a tunnel while being chased. They stop at a juncture and Tie Shou releases a bunch of rocks (a trap Yi Yi and Zhui Ming set up earlier) on those behind them. Back at the main cave, Zhui Ming injures some of the Wen minions by using a mini bomb. He then saves Yi Yi. However, Wen Ru Yu spots him and throws a dagger at him while he has his back turned. NEVER HAVE YOUR BACK TURNED! Anyway, it isn’t a big deal though because Leng Xue arrives just in time to intercept the dagger. Li Mo also appears. Why is she there? It’s probably not very safe… And remember when she was there last time? She was such a burden! And I’m right too! 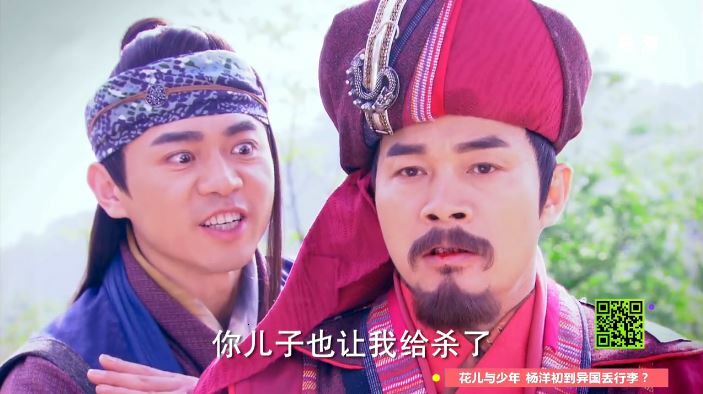 Wen Ru Yu releases some poisonous birds on them and Leng Xue is totally occupied by protecting Li Mo from getting attacked. This girl needs to learn some moves besides mind reading. Also it’s kind of bad, but it’s really hilarious watching them fighting birds. Soon enough they take the fight outside. 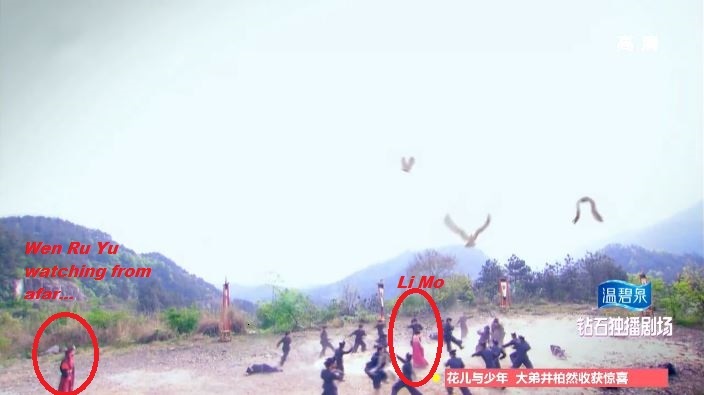 Li Mo is still in the middle of it all but I guess at least everyone around her are apt at fighting. Well, Li Mo is useful after all! She suddenly remembers that she can mind read and so she tells the birds to bite the bad guys. Yay! To survive, Bing Er ate peaches in the summer, peach flowers in the spring and walnuts in the winter. So how does she reach the tree branches in a wheelchair?? 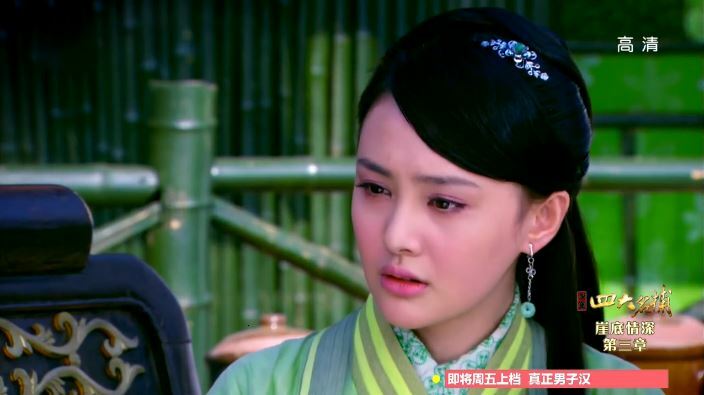 Zhui Ming promises to save the Princess and tells her he will die with her if he cannot. Her response? “I want to leave this place NOW!” Argh. The creepy dude tells Wen Ru Yu that he killed the latter’s son before running away. dubs? you mean the actors’ voices? or do you mean you are watching other people dubbing them in english or something? Yeap, I mean the actors’ voice. When I read your recap, I was hearing the original actors’ voice in my head so when I watched it for my own, I was taken aback by the difference in voice haha.